FASTCarhire in Switzerland is cheaper here. Compare Swiss estate, MPV, 7/9 seat minivan & SUV reduced rental prices. Compare cheaper car rental in Switzerland and save money on that next Swiss estate car, SUV, MPV or minivan hire.We have a good selection you can choose from that includes:- Avis, Budget, Dollar, Europcar, National/Alamo and Sixt. Prices include all the standard, expected inclusions, like mileage, breakdown, CDW, insurance. However, some companies, like Keddy, may have a mileage cap, before you pay extra, per kilometer travelled. You can also hire a car on the French side, so best check rental prices and availability for both sides. Europcar are guaranteeing your model on certain car groups, like the VW Touran, VW Passat estate, so keep an eye out when booking, or email us if help needed. The amount held on your credit card varies by supplier and car type, and as can be a lot, as can the extra insurance to reduce to zero, please feel free to drop us an email, and we can help. We have hybrid and economy car options as well as the estate, SUV and MPV. The economy category includes the Fiat Panda, Opel Corsa automatic and the compact Peugeot 308 diesel. If going in the Swiss summertime, why not consider the stylish VW Beetle Cabrio. The Peugeot 807 will seat 7 passengers in comfort. To book car hire in Switzerland all you need is a current driving license issued in your home country and a credit card for the local security deposit. Motorways connect all the major Swiss cities. Drivers, even those with car rentals, are required to display a vignette tax disc when using these principal routes. Roads through the Alps are twisty with lots of switchback bends. Always book early, especially if going in ski season. 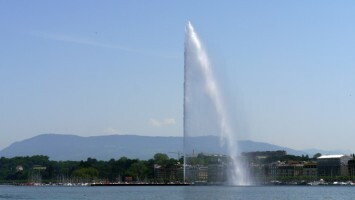 If flying into Geneva, then read our guide on Geneva Airport. Built-up areas:- 30-50kph, National highways 80kph, Motorways 120kph. The limit for drinking and driving is 0.5 mg/ml. Or Geneve, as it is also refereed to, is sometimes mistaken as the capital of Switzerland, with its association with banking and watch making. However it is the third largest and is clean, safe and great for shopping if a little more expensive. Has the popular Basel-Mulhouse Airport, also referred to as EuroAirport. The airport is situated between Mulhouse in France and Basel in Switzerland. Is ideal for a weekend break. If you have a little extra time, visit the Uetiberg, with its breathtaking views of Switzerland. Visitors arrive and hire drive away quickly from ZurichInternational Airport. Cheaper Swiss SUV, MPV & 7, 9 passenger minivans. Good discounted holiday auto prices throughout Switzerland. Going skiing? Easy booking of estates at all airports. Switzerland looks fantastic throughout the year and can be visited at any time. If you want to spend your time on activities such as hiking or sightseeing then late spring or autumn is best. The lakes are warmer in summer and water-sports are more fun at this time. Comprising a good proportion of the awesome Alps mountains, Switzerland is the perfect destination for those who love nature and the great outdoors. 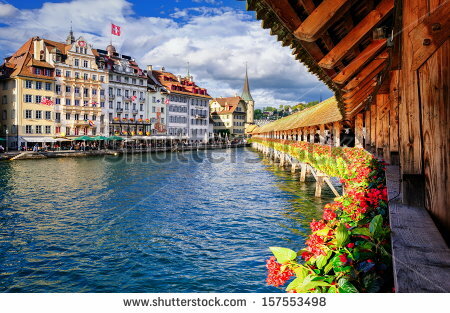 The cities of Bern, Geneva and Zurich all lie on the Swiss Plateau and are convenient start points for exploring the Alps with car hire in Switzerland. 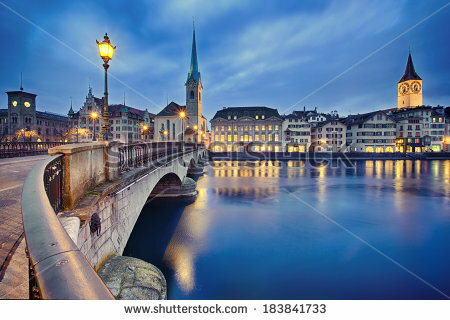 The old city precinct of Bern was built on an oxbow bend in the River Aare and dates back to medieval times. It is one of several UNESCO Heritage Sites in Switzerland. The International Red Cross Museum is located in Geneva and one of an estimated 1,000 museums in the country. Switzerland's events calendar is busy and visitors often time their trips to coincide with major happenings such as the Locarno Film or Montreux Jazz festivals. Most ski areas are open between November and May, but at those resorts with glaciers, like Zermatt, you can see all year round, although would just be mornings, before the sun gets too far overhead,but leaves the rest of the day for other pursuits. Take the road around the north shore of Lake Geneva links Geneva to Lausanneand Montreux. Parts of the roads are raised and give commanding views of the lake. Chateau de Chillon is a magical edifice just south of Montreux. Martigny is 40kms south of the chateau and one end of the legendary Great St Bernard Pass to Bourg St Pierre. The pass is noted for its stunning mountains. 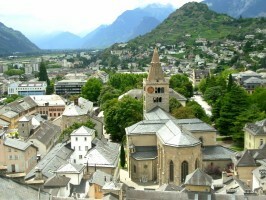 Martigny has ample draws among which are a well-preserved Roman amphitheatre and the Earth Science Museum. 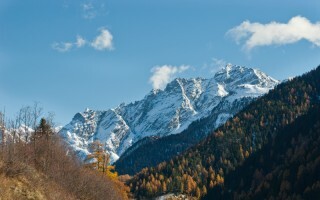 In the high-altitude Alps south of Lucerne, three interconnected passes offer an unmissable road trip.Thethree passes are the Furka, Grimsel and Susten. Brig-Glis is home to the fabulous Stockalper Palace and the east end of the passes. The Furka pass was immortalised in the James Bond film, Goldfinger. If you are a ski buff, then Zermatt is a must see ski resort at anytime of the year. The town nestles in a bowl of five mountain peaks, capped by spectacular views of the very impressive Matterhorn mountain. These conditions guarantee excellent snow conditions for skiers, snowboarders and langlaufers in winter. There are also a number of safe walkways through the mountains for the non skier. In fact spring, summer and autumn, are also popular times for mountain bikers, hill walkers, shoppers and even skiers who can ski the glacier at Klein Matterhorn all year round. Cars are not allowed in the town of Zermatt and are left at the train station below Zermatt, and everyone catches the train into the town centre, where electrified taxis are waiting to take you to your hotel. This should make walking around the beautiful streets much safer, but you still need to keep an ear out for the electrified noise of a taxi sneaking up behind you. However, a taxi is most welcome for getting home after a long day skiing, especially if stopping for some apres-ski in the Popperla Pub or Grampis. 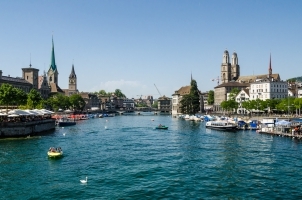 For more on what to do in the land of Swiss Army knives, cuckoo clocks, banking and yodeling, go to the Switzerland Tourist Board to find out more.